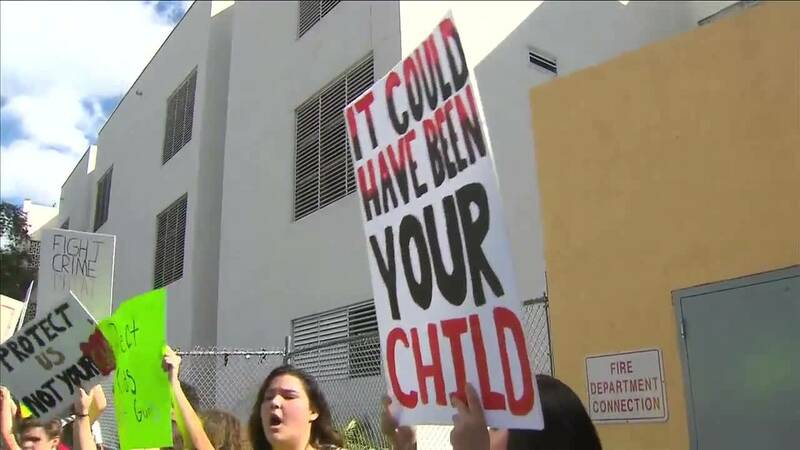 HOLLYWOOD, Fla. - Students gathered outside a South Florida high school Friday to protest current gun laws after the mass shooting at Marjory Stoneman Douglas High School that left 17 people dead. About 100 students chanted and raised signs demanding action from lawmakers on the issue of gun control. There's a gun for every American. But less than a third own guns. "How did Nikolas Cruz (have) access to get (an) AR-15?" recent South Florida high school graduate Ashley Laurent said. "He's just 19 years old. He's not even legal to drink yet." Cruz, 19, was arrested and faces 17 counts of premeditated murder in connection with Wednesday's massacre at the Parkland school. Authorities said Cruz was able to legally purchase the rifle at Sunrise Tactical Supply in Coral Springs last year. The protesters stood on the sidewalk outside the school as a student led them in their chant: "What do we want? Gun control. When do we want it? Now." "What do you want politicians to do?" Local 10 News senior political reporter Michael Putney asked South Broward High School senior Elizabeth Dicovan. "To pass more gun laws to restrict -- to make it harder to get guns, because it doesn't make sense how guns are so easily acquired," Dicovan said. "Like, it doesn't make sense." Protest organizer Ellie Branson took aim at politicians like, in particular, Sen. Marco Rubio, R-Fla., and his campaign contributions from the National Rifle Association. "Marco Rubio received $3. 3 million from the NRA in the 2016 cycle," Branson said. "He says that his prayers and condolences are with the families of the shootings after each shooting that happens nationwide, but if his prayers and condolences are really with the people and the families, he should stand up and do something." Rubio stood Thursday on the floor of the Senate and agreed that Congress has "to do something." "I would add, though, that if we do something, it should be something that works," Rubio said. Rubio was scheduled to meet with the shooting survivors and their families later Friday.